Whether you consider the roof a top hat on a sharp-dressed house or just a way to keep the rain off your family and belongings, the different types of roofs make a difference. Although most roof shapes are chosen for their looks and how well they integrate with the surrounding homes, there can be some real benefits and disadvantages as well. Hip Roof – This style of room resembles a short pyramid on a rectangular house. Each side of the roof comes down to the top of the wall instead of forming a wide V like a gable roof. Gable Roof – Perhaps the most popular style of residential roof, the gabled roof forms a wide V with the roof stretching from one wall to its perpendicular partner. The house citing extends above the height of the walls into the V where the attic would be. 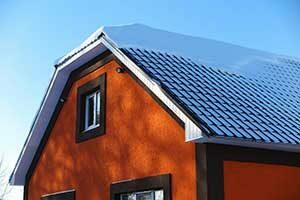 Flat Roof – While there are completely flat roofs, most are slightly angled to facilitate rain, snow, and ice runoff. These are rarely seen in residential buildings but could be an option to consider. Mansard Roof – These roof shapes look a lot like a hipped roof but, instead of gathering at a point on top, the middle section is shorter than it would normally be. The sides have a greater angle while the very top is practically flat. Gambrel Roof – Instead of two flat planes of the roof, a gambrel style has multiple planes arranged at gentler angles. Classic barns usually have these roof styles. Many residential homes are not just one rectangle, so the chosen roof must fit together like a puzzle to provide seamless protection for the entire building. Occasionally, the roof styles are combined, such as an angled classroom over a room addition that juts out from a gable roof that covers the rest. The roof styles and shapes you choose for your house depend on multiple factors. Although protection and durability are both important, the roof style and roof shape you ultimately decide on depend on personal preferences, the shape of the building itself, and community continuity and guidelines or regulations. Hipped clay tiles roofs to asphalt shingled gables, Legit Exteriors can handle your residential roof needs in the Portland OR and Vancouver WA areas.